Joey visits his friends in uniform! 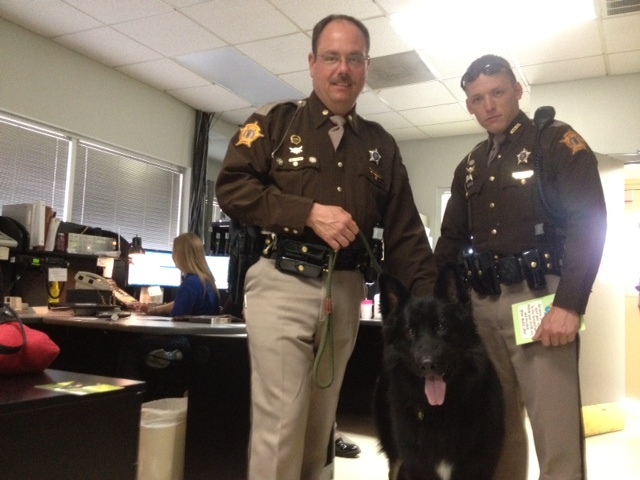 Joey’s journey takes us to the Marshall County Kentucky Sheriffs Department. Our friend and Chief Deputy David Maddox gives us a tour of the 911 dispatchers office where Joey charms the staff and allows all these dedicated professionals a chance to lower their stress level for a short time. Thank you David and all the employees of the Marshall County Sheriffs office for your tireless devotion to our communities safety and well being. A quick trip to the Marshall County Clerks Office to renew my driver license ends up being an emotional therapy visit for the girls in this office located next door to the Sheriffs Department. Joey enjoys all the attention while Mr. Bob gets his license renewed. Joey was being held hostage until he promised that he would visit again. Onward toward Paducah Kentucky making another quick stop to see our friends at Reidland Pharmacy. The staff here loves Joey. Thanks girls for all the special attention given to me and Joey! Back in Paducah we experience thunder along the river as the annual Toys for Tots motorcycle run for charity begins rumbling along their way. Joey takes position to wave at the seemingly endless swarm of motorcycles as they roar toward Noble Park where toys are collected for such a worthy cause. Thirty long loud minutes of bikers takes a tole on my friend so we retire to his favorite place at home straddled over his air conditioning vent. Good boy Joey you are such a blessing.